•5TE.P ONlE. - Paul usually begins this effect as an "expose" of "Tap Dancing Aces" (see Index), so to get ready he scoops them up in a staggered position with the right hand, as the left hand gets a break under the top card of the deck. Place the face-up Aces on top of the deck, then square them from above with the right hand, taking all five cards above the break. This is done during the opening monologue, so as you can imagine, it goes unnoticed! Continue by counting the four Aces, turning them face down onto the bottom of the five-card stack as you count. This leaves the indifferent card on top of the face-down pack. 6TE.P TWO - You will now use a very deceptive method for placing a double onto the mat. Begin by doing the Ascanio spread. Hold the cards face down from above with the right hand, with the second finger at the front, thumb at the rear (Biddle Grip) (FIG. 1). The left fingertips pull the bottom card to the left and forward (FIG. 2). Now, you'll move this card down again, but as you do, the left thumb moves the top card to the left and down as well (FIG. 3). This leaves three cards still held flush between the right middle finger and thumb. Extend the left middle fingertip past the first card pulled off, and slide the bottom card away from the three cards held by the right hand (FIG. 4). it pinched in between two cards. Since there is very little friction between cards sliding against each other, you can allow this double to slide onto the table (if you find the right agle). The right long edge of the double should be resting on the mat as you set it down (FIG. 5). Note - This lay-down of the the double requires a delicate touch. The standard, less touchy, approach goes like this: Hold the squared face-down packet in your left hand and squeeze the sides of the packet to give it a slight downward bow. Thumb off the top three single cards out in a row onto the table. Grasp the remaining double from above by its ends with with your right fingers, flash its face, then place the tip of your right forefinger against the back of the double to gently press it away from your other fingers and onto the table. 6TELP TJ-lR-E-EL - You are now ready to demonstrate the Art of Plaming. Lever the top card of those in the left hand away from the rest, in preparation for the Tent Vanish. Paul is very specific about his technique for this, so I've described it in complete detail elsewhere. Basically, the top card of the three is angled away from the others, and held there by the left thumb (FIG. 6). As the right hand covers this card, it is allowed to fall back onto the others. 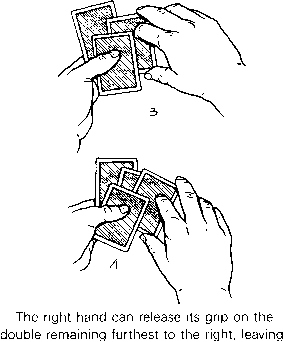 (Note that the right first and second fingers are somewhat separated as they move over to "take" the card (FIG. 7). 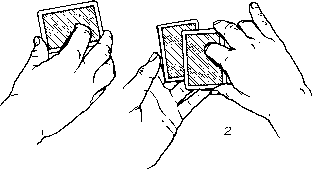 The card is allowed to fall back only when the fingers are brought together in palming position, giving the spectators the opportunity to see the card right up to the moment it is supposedly palmed. The right hand makes several squeezing motions, as if following through on the plot of working it into the flesh. As amazing as it seems, Paul tells me they go for it. In spite of the wild concept and funny patter, the technique is so sound, they have to buy it. Paul then unnaturally contorts his hand as he says, "Notice the natural positon of my hand...no one would ever suspect." 5TE-P FOUE. - Before setting the card down, make sure you show the right hand unquestionably empty. The Jeff Busby technique for making the card reappear is going to look exactly as if you placed a card from the palm onto the table. 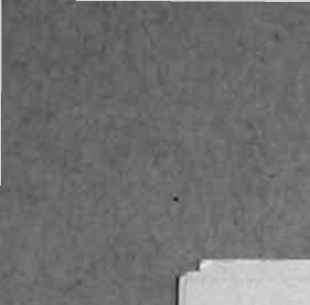 As the right hand approaches the table, make certain the palm has a tilt to it that allows the base of the hand to contact the back -right corner of the card first (FIG. 8).